This season, we’re seeking a fresh, new look for Vermont State Parks water bottles that are sold all over the state and on the web, and we’re asking for your help! 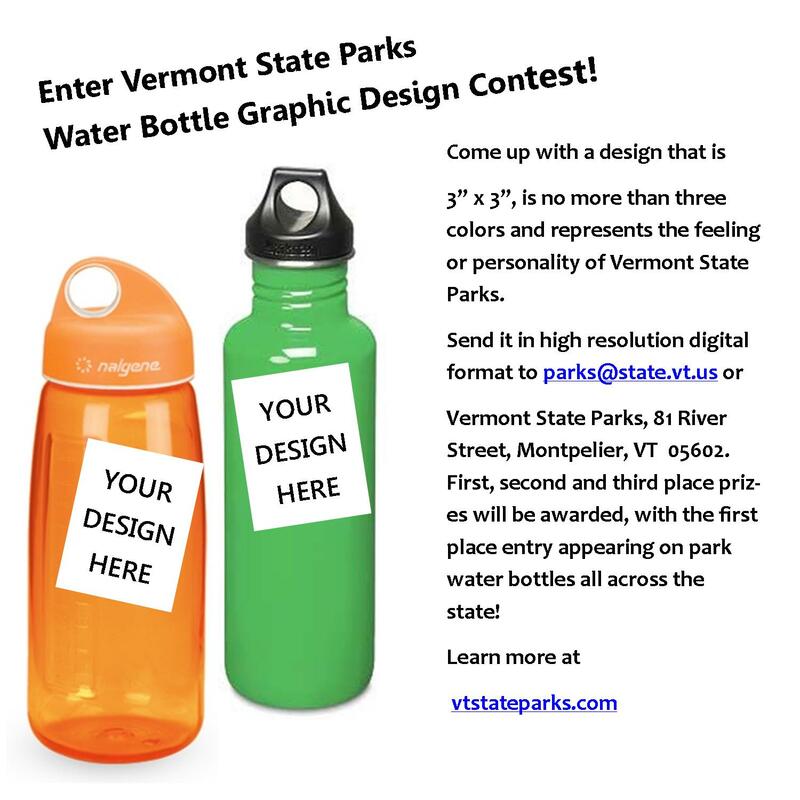 We invite you to participate in Vermont State Parks’ first ever Water Bottle Graphic Contest! Come up with a graphic design that is, or can be shrunk, to 3” x 3” that embraces the personality or feeling of Vermont State Parks. The design should use only three colors and will need to fit a variety of and materials and colors (green, blue, plastic, stainless steel, etc.). We’d like graphics submitted in high-resolution digital format, if possible. What are snow rollers? Snow rollers are a rare phenomenon where snowball form naturally by a very strong wind blowing across a flat, snow covered field when the snow is easily compacted. It's natures way of making a snowballs. They started appearing Sunday in many fields around Vermont. The conditions were perfect mid-day. Thanks to our friends at WCAX, News Channel 3 we got to see some photos from all around the state. Looking to enjoy the VT State Parks in the Winter? With all of the birding activity at DAR we have plowed parking spaces and of course in the winter time there is no entrance fee. So head on out and go birding. 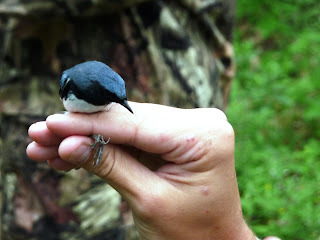 Here is the latest information from VTBIRD on what's going on in the bird world in Southwestern Vermont! 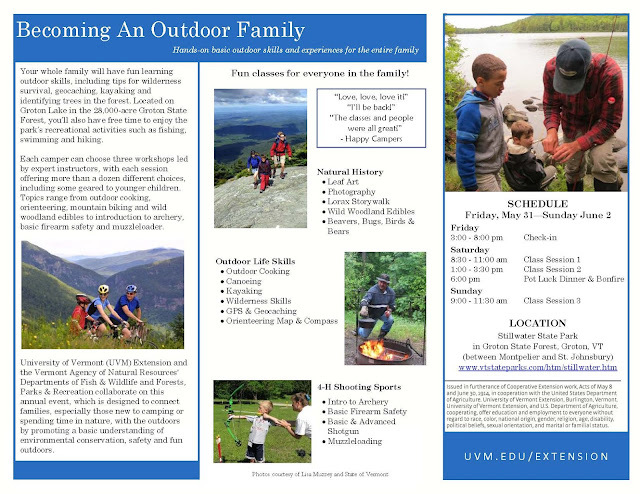 Your whole family will have fun learning outdoor skills, including tips for wilderness survival, geocaching, kayaking and identifying trees in the forest. Located on Groton Lake in the 28,000-acre Groton State Forest, you’ll also have free time to enjoy the park’s recreational activities such as fishing, swimming and hiking. Each camper can choose three workshops led by expert instructors, with each session offering more than a dozen different choices, including some geared to younger children. Topics range from outdoor cooking, orienteering, mountain biking and wild woodland edibles to introduction to archery, basic firearm safety and muzzleloader. 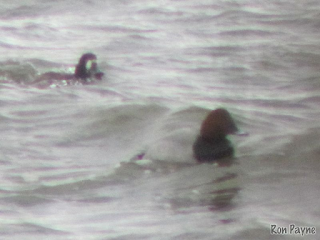 We have been eagerly following the news of these two ducks along with you. Here at Vermont State Parks understand that DAR is probably now the best viewing location and that there's not enough room to park at the gate. We have asked one of our maintenance staff to go up to DAR early to open the gates and plow out some spaces for birders to park.